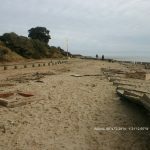 On the 6 June 1944 thousands of troops with their vehicles and supplies left Britain via locations such as Lepe Beach in the New Forest for the beaches of Normandy. This was D Day, the start of the great campaign to liberate Europe and to bring the Second World War to its end. The D-Day invasion, code named Operation Overlord, is one of the most remarkable feats in military history, it had toke over two years of planning, and was one of the best kept secrets of the war. 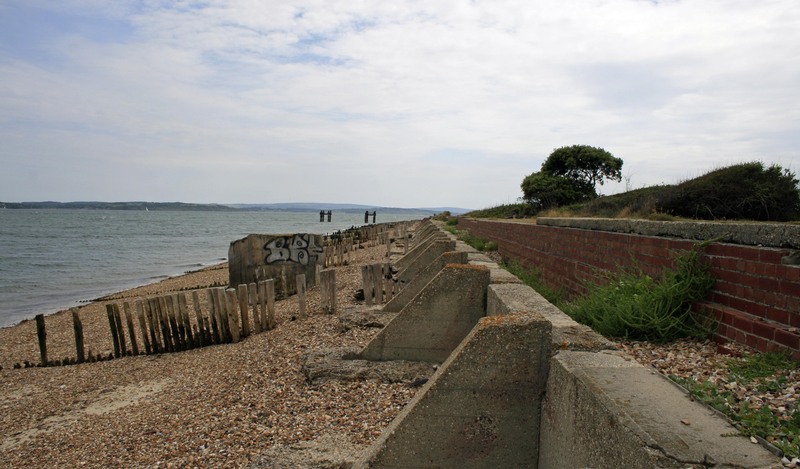 During the build up to D Day troops and supplies were marshalled along much of the Hampshire coast. 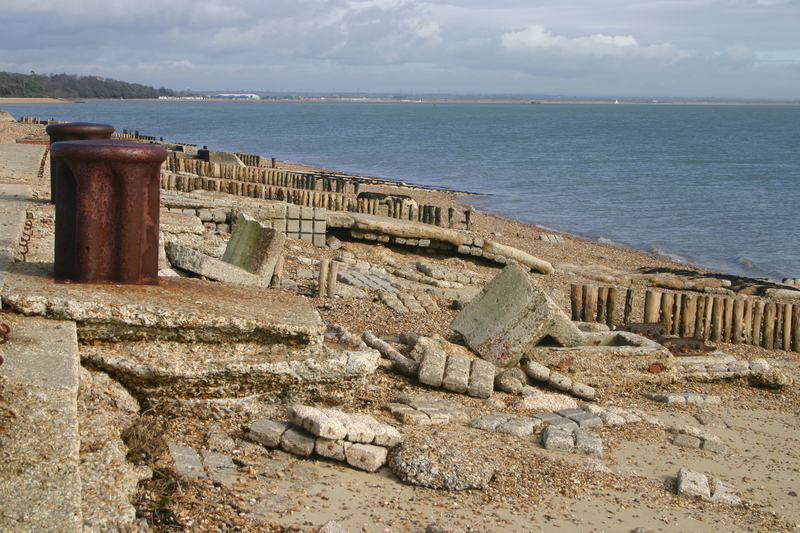 Lepe and the surrounding area came under the control of the shore station HMS Mastodon, the headquarters of which were at Exbury House. Many hundreds of troops with their equipment, vehicles and ammunition were hidden along the narrow roads and in numerous closed camps hidden in the wooded areas accross the New Forest. 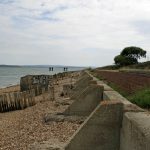 Even before the build up of troops, supplies and machinary had begun the south coast was busy with the construction of Mulberry Harbour elements that would be essential for supplying the army on the beaches of France and allow the allies to launch an attack on the Normandy Beaches rather than the very heavily defended deep water ports. 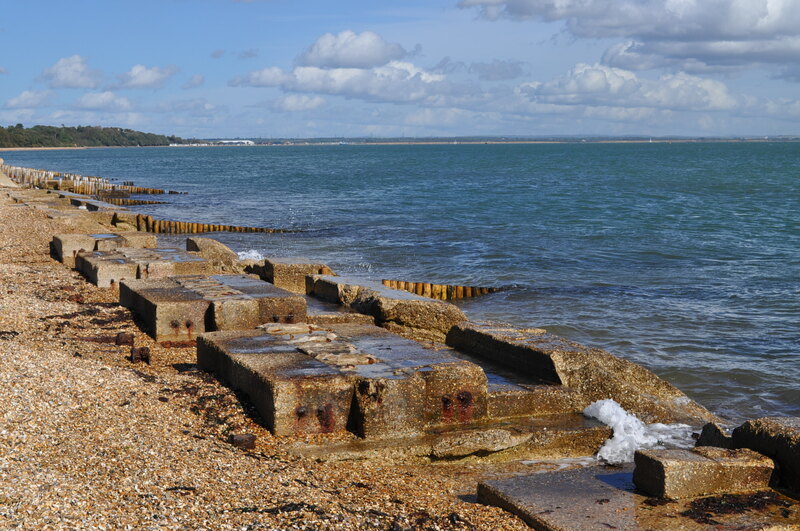 The idea to build a harbour on the south coast and take it with the invasion force was a brilliant feat of engineering and was one of key factors in the success of Overlord. The floating harbours was to be assembled from a variety of component parts manufactured on the south coast. Several construction sites were chosen. 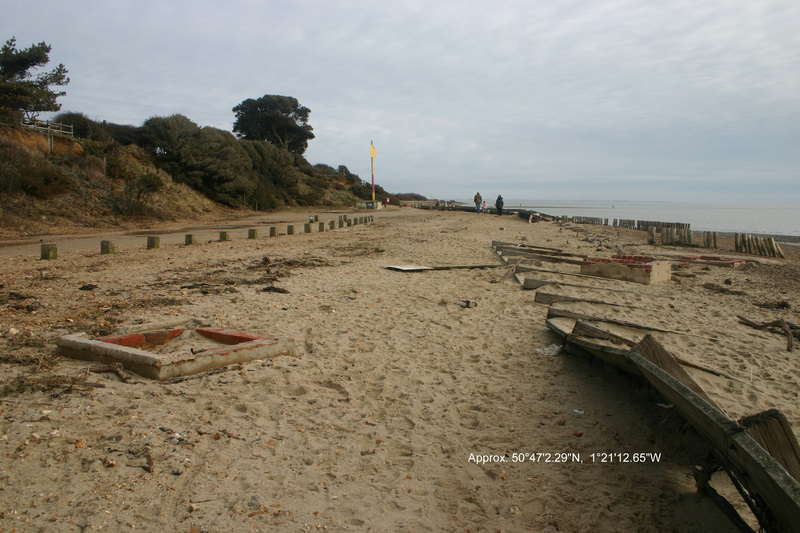 The beach at Stanswood Bay being used in the manufacture of six type B2 Phoenix concrete caissons. 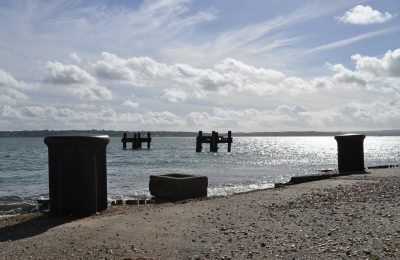 The floats ‘Beetles’ supporting the roads connecting the harbour to the beach were constructed along the Beaulieu River and at Marchwood. 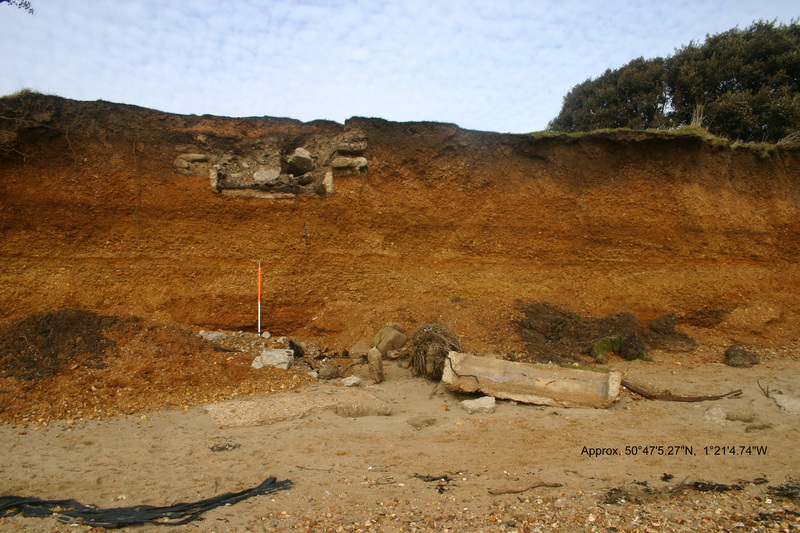 Many of these sites still retain some of the archaeology associated with the Mulberry project today. 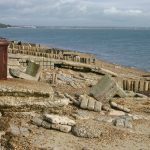 Today at Lepe you can still see plenty of evidence of wartime activity. The concrete floor remains of the site buildings used by construction workers and the military. They are dotted about in the Country Park area. Water Tower Base used for water purification, required because so little fresh water was available on site. Construction Platforms where the caissons were constructed. Today, although parts are storm damaged, the platforms run for 374 metres and are 11m wide and 1.3m high. The platforms were large enough to construct all six caissons simultaneously, reflecting the urgency of the work. 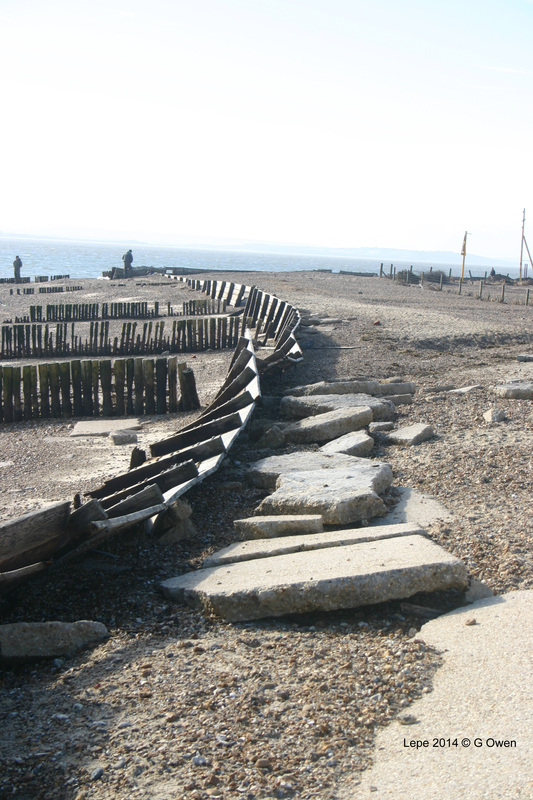 Beach Hardening Mats which resemble huge bars of chocolate, were held in place by a series of iron hooks. They were laid out to strengthen the beach enough to take the weight of the tanks and other vehicles being driven onto landing craft. Dolphins forming part of the pier head used to load ships departing for Normandy. 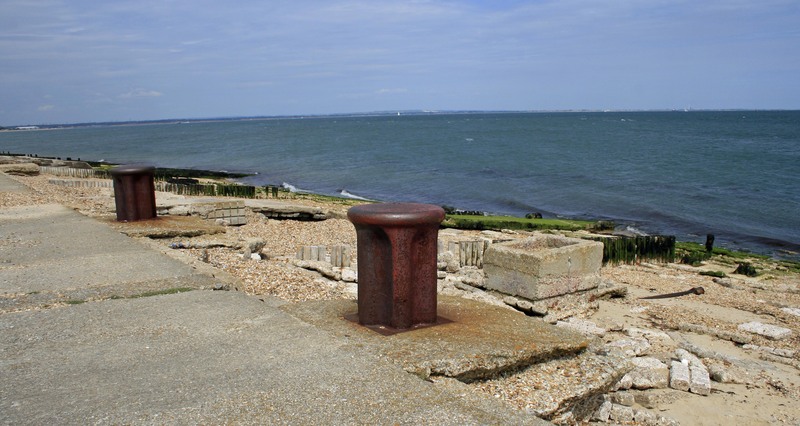 Bollards used to tie up the ships that were being loaded for the invasion. 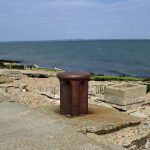 This recent drone footage of the site gives a birds eye view of the extensive features that were designed and built to support Mulberry and D-Day at Lepe. 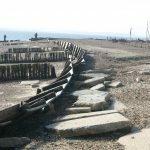 If you have more information on D-Day in the New Forest or memories of the closed camps or embarkation please share them with us on this site. These were 25-pounder Sexton = http://en.wikipedia.org/wiki/Sexton_%28artillery%29; units were 90 and 147 Field Regiment, Royal Artillery. D-2 – AVRE, 69 Brigade With their Petard Mortars, http://en.wikipedia.org/wiki/1st_Assault_Brigade_Royal_Engineers; they were accompanied by Squadrons from the Westminster Dragoons with their ‘Sherman Crab’ flail tanks http://en.wikipedia.org/wiki/Westminster_Dragoons#Second_World_War. D-1 – Army Fire Service. We do not know what his was composed of. The D.D. 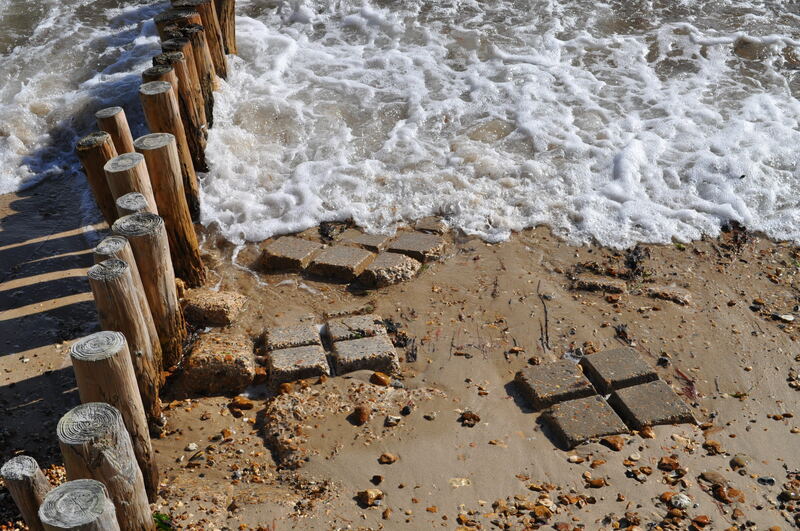 tanks were landed directly on the shore due to the rough conditions. The Canadian Unit the 2nd Canadian Armoured Brigade, which was attached to the 3rd Canadian Infantry Division which formed the core of ‘Force J’ the assault force for Juno Beach, they left the area in April 1944 to prepare for embarkation from the East side of Southampton Water. 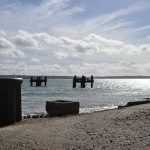 The embarkation points at Lepe were in constant use for training and for ferrying troops to and from the Isle of Wight, well before the D-Day loading, during this earlier use infantry units were also frequently using the site, not just mechanised units. 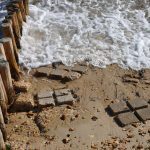 The storm that arrived late on Friday evening (14 February 2014) exposed a couple of small brick structures in the beach front car park. 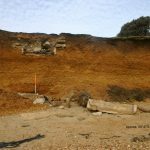 Further erosion along the coast caused a possible gun emplacement to start to collapse on to the beach. 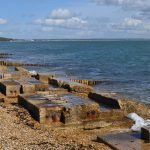 Caissons built at Lepe were built by Lovatt Ltd.